For more in depth product explanations, please see the bottom of this page. The perfect kit to get you started. Includes (2) complete ICEBIRG LITE 2.5" Ice Ball Presses, plus (1) PURUS PRO Commercial Clear Ice System (5 Units) for generating up to 25 perfect Ice Slugs per cycle. Also included is Press Armor for commercial strength protection, and our SS Ice Tongs. 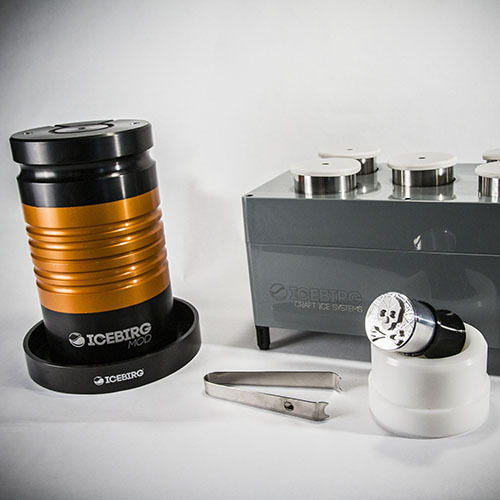 Includes (2) complete ICEBIRG PRO 2.5" Ice Ball Presses, plus (1) PURUS PRO Commercial Clear Ice System (5 Units) for generating up to 25 perfect Ice Slugs per cycle. Also included is Press Armor for commercial strength protection, and our SS Ice Tongs. - Many more Insert Options Coming Soon! Includes (1) complete ICEBIRG MOD Interchangeable Craft Ice Press, plus (1) PURUS PRO Commercial Clear Ice System (5 Units) for generating up to 25 perfect Ice Slugs per cycle. Also included are our SS Ice Tongs. In addition you will receive (3) CUSTOM ICE Branding Irons for customizing your craft Ice with your Messaging! The PURUS PRO is an earth shattering insulating system that forces your Ice slugs to freeze perfectly clear. At NO point does your water/Ice touch any plastics or silicone, only metals here, meaning nothing will wear out, or contaminate the flavor of your Ice. The System can be used in 24hr or 12hr Cycles. With the Commercial Kit, 25 cylindrical slugs (apprx 2.7" x 6) are generated every cycle. These slugs perfectly fit into all of our Craft Ice Presses for quick, Perfectly Clear Ice spheres or shapes. Our Ice Ball Presses form Perfect Spheres of Ice by utilizing their weight/mass, and the thermal transfer of energy from the Aluminum they are made from. No cords, wires, or batteries involved. We offer the highest performing Presses on the market, at a fraction of the cost of the other guys, and everything we offer is made right here in the USA. The MOD is an incredible one of a kind professional device that works under the same principals as our other Ice Ball Presses, it is just MUCH bigger, faster, and durable. This Press was built with extensive input from leading industry professionals to be the ultimate Craft Ice Press. Size & Speed aside, it's greatest offering is it's interchangeable mold inserts, allowing for various custom and standard shapes of Ice. This Press currently ships with our standard 2.5" sphere inserts, as well as a 2.3" Diamond insert. Harnessing our extensive in-house machining capabilities, we decided it was time to offer a truly custom solution for those brands looking to put their logo or message "on ice". Working on the same principals of thermal transfer, our BIs are machined from 6061 aluminum rod, then fit with a flexible TPU Polymer grip and a polymer non-thermal Ice tray for easy application. The result is a perfect Ice Sphere, with a flattened message space that will roll to the top of the glass and continue to melt with the drink. No one else offers ANYTHING like this, get your brand noticed!